So far layed out, rough cut, template started, planed, and checking out how parts will look together! Aside from the 6 vs 2 screws, is the modern tremolo routing the same as the vintage? Already bought my Fender neck...next time, I'll try my own! Still thinking about grain filling and finishing. Do I want it shiny or just oiled? Also, thinking should/can I recess the back tremolo cover? Grain filling isn't really a given thing depending on the finishing type you choose. More to do with how you want the finished product to look. Open grain can look more organic and natural, whatever type of finish you choose to apply. 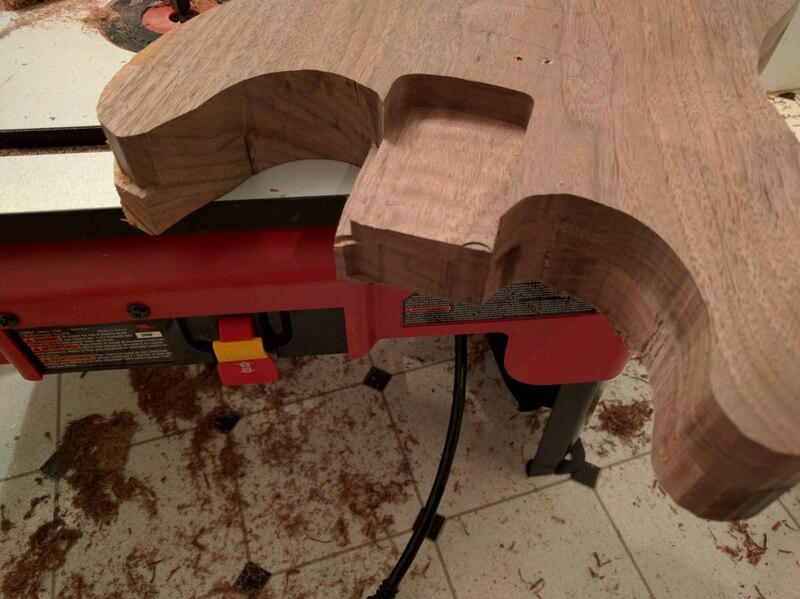 Filled grain will look more smooth and sleek. Oil finishing is easy if you don't have the spray equipment or the room to spray. Gloss finish is possible without spray guns, but can be a little trickier to achieve. Given enough care you can get similar results with brushed-on finishes. Trem cover - you can recess if you like provided there's enough clearance for the trem block to swing inside the cavity without hitting the cover. If you're going to use the one shown in your pics I'd suggest not recessing though as it looks like the edges of the cover are bevelled, and it may look a little odd if it were recessed flush to the surface of the body. Walnut is a lovely wood for using tru-oil with. It can be applied to a standard semi-gloss in the normal way or, you can use a 'slurry' method - where you use wet and dry sandpaper with the tru-oil to create a grain-filling slurry, which is then buffed off. It can even be done on the kitchen table ("what's that? No, dear, I NEVER do that....not even when you're away at your sisters..." ) with just a bottle of tru-oil, a sanding block and a couple of cheap microfibre cloths. That should be a fun project. Let the games begin! That's the spirit! Nothing like earning a refreshing cold one after achieving important working stages. Looks good, can't wait to watch your progress. 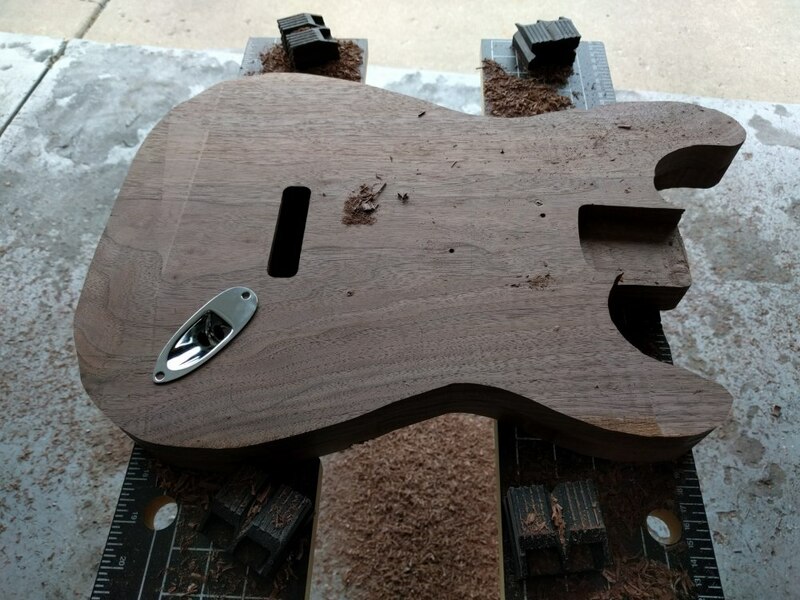 I'm pondering to build a walnut tele. 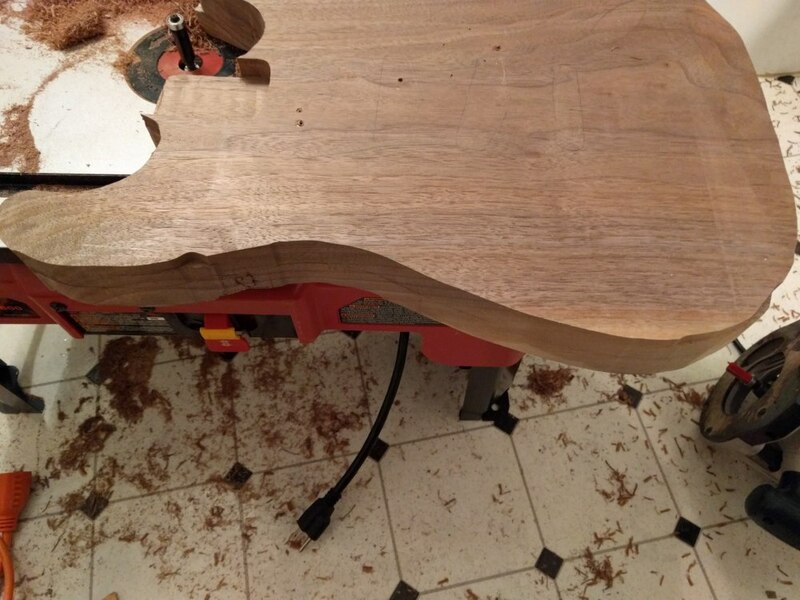 @bileshake - Walnut's a great wood to work with. 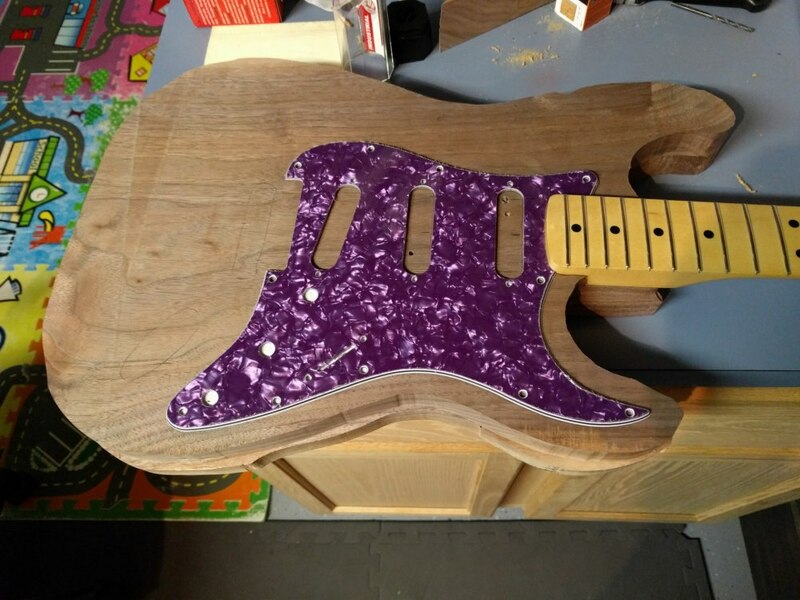 It teaches you good sanding technique and discipline, especially when you want to get to oil finishes as sublime as the one @Andyjr1515 posted. Totally worth every minute. And 'tis a fine lookin' piece of walnut too. ALways liked oil finishes and see the wood. Good luck @bassplr19 ! @Andyjr1515 that's a brilliant EVH! gorgeous wood and finish! 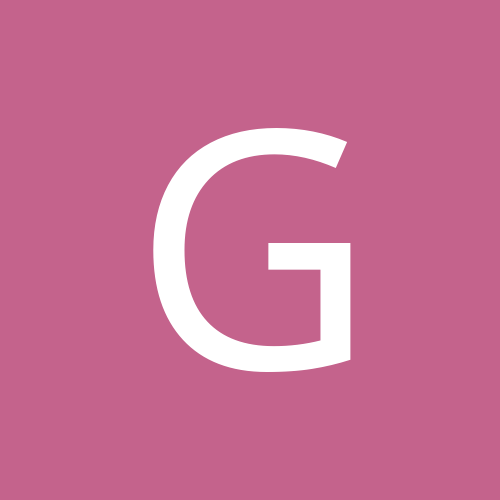 Did you build that yourself or did you use an existing wolfgang for that? 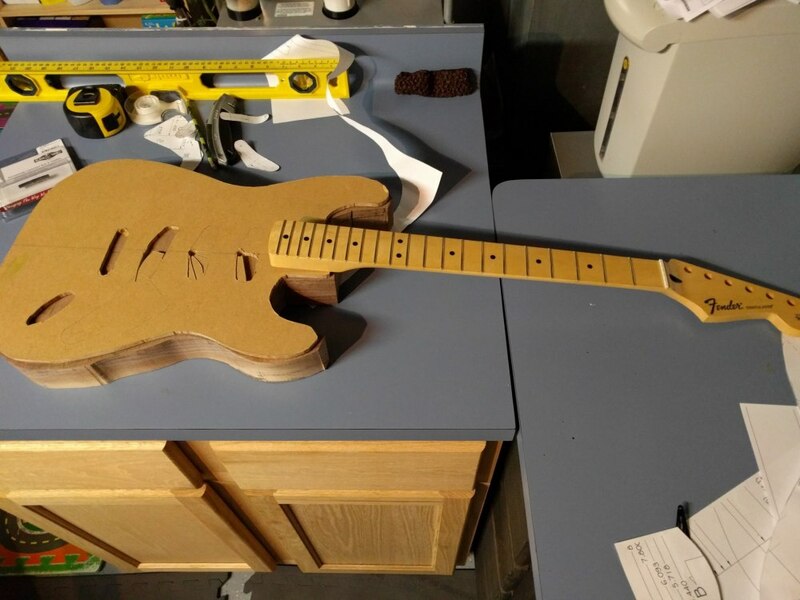 It was a rebody I did for a guy who had the Peavey EVH and wanted to have a little more 'bling' So I cut and carved him a new body from a nice piece of NA walnut I spotted on ebay and transferred everything else across from the Peavey. Nice guitar....I hadn't really had them on my radar before this. If it had been for myself, I would have gone for the carved top (ref the EVH produced ones) but the guy specifically wanted flat topped. 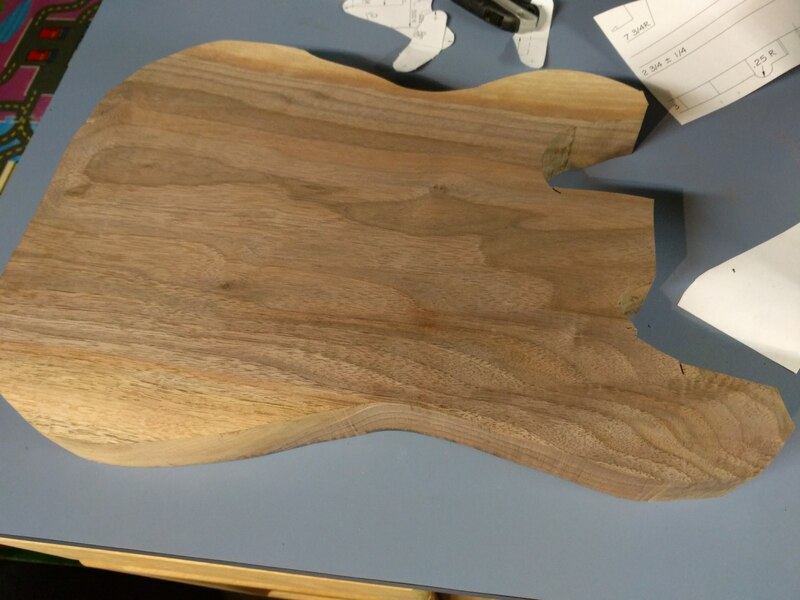 More routing, template top, top side, and start of neck pocket - had some router digging into the template issues, but those areas should be mostly rounded out or beveled off. I like the idea of using the bathroom, @bassplr19 ! In my case I'd need to take the bath out, of course, and suggest to MrsAndyjr1515 that she asks the neighbours if she can borrow theirs when she needs the shower, but I'm sure she'd understand! I think we've all dug into a template in our time. 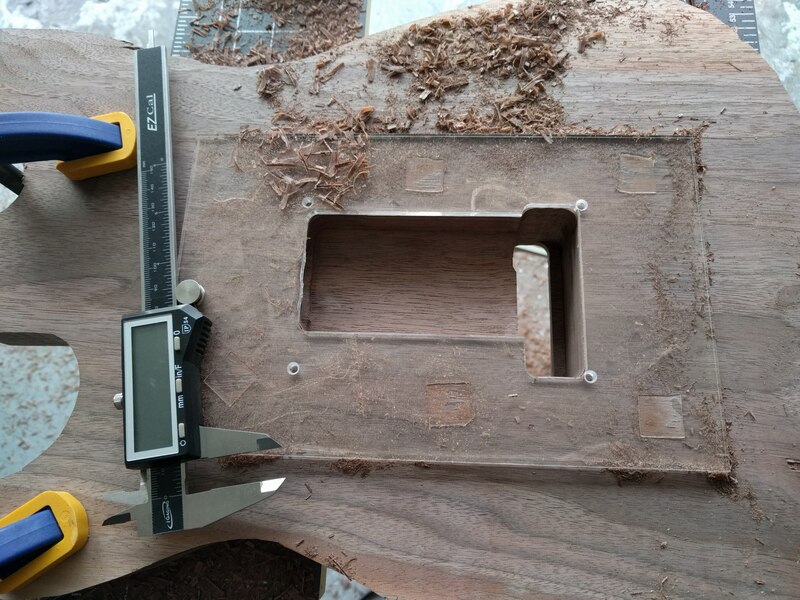 I don't have a routing table, but I've certainly done it in the past with a hand router. 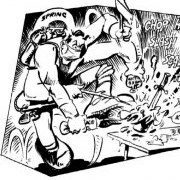 The most common cause is the bit hitting a big bit of wood and bouncing around causing mayhem. The order of the day with routers is 'check and double check' and multiple small passes rather than trying to take too much off at a time. 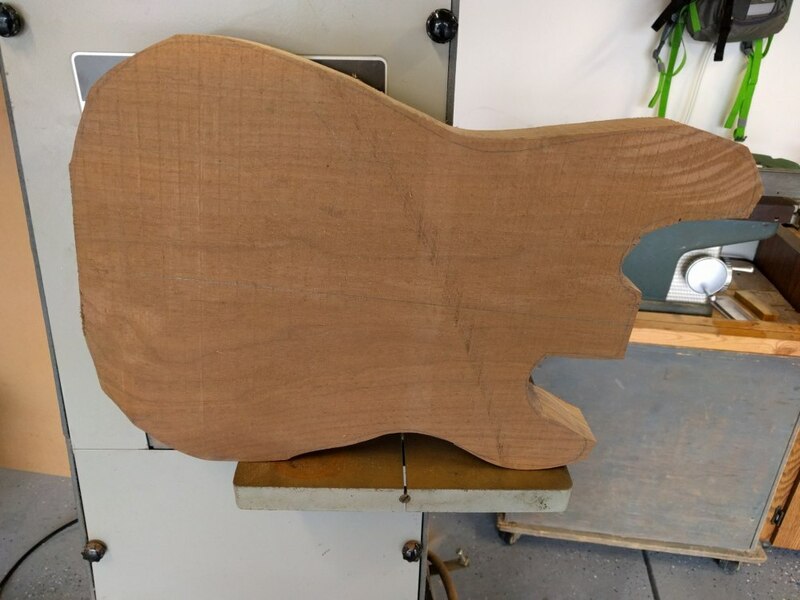 I've even done an oversize template in the past to get the blank close to the final shape, taking off any major projections that could catch the bit, before swopping to the final template. I've done that before myself. Wet router sawdust doesn't clean up as easily as one might think. Can you blame me for testing it out? I bought a Fender Neck Plate with the F on it. 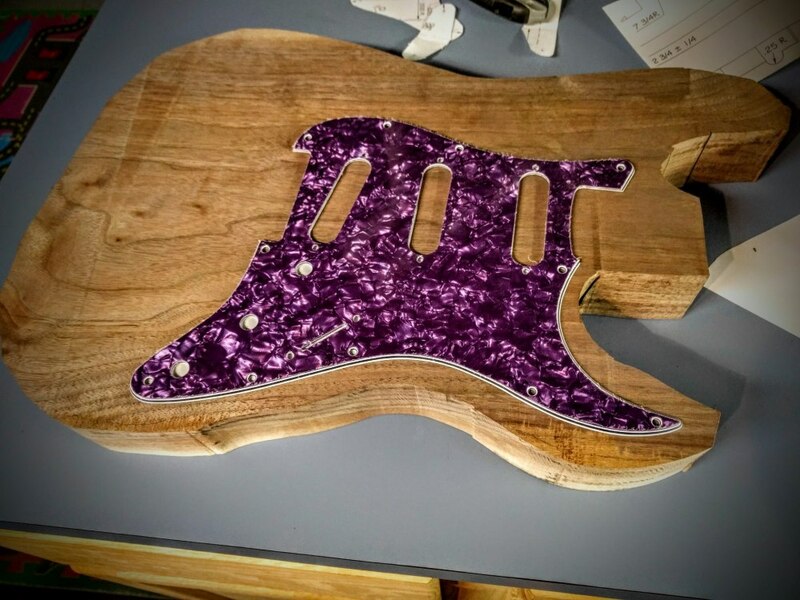 I want to do a contoured heel like Warmoth offers, so I started googling "contoured heel strat dimensions" - nothing good was coming up. All I really wanted was how shallow a contoured heel is, finally realized I can just look at the screw lengths for a contoured heel neck plate set and go as deep as the difference!! It looks like I'll be safe in the .25"-.375" range. More routing fun, trem cavity and jack cav. It's nice out, so I played in the garage! 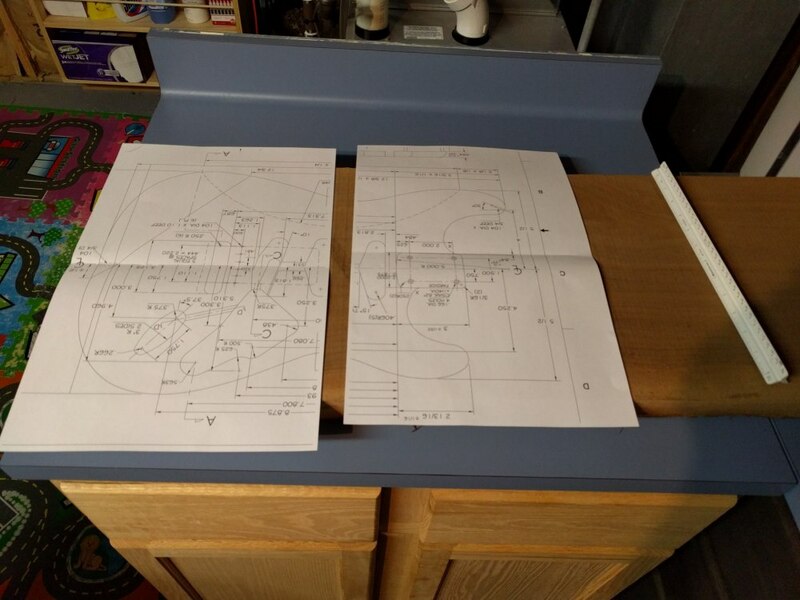 I see that you already routed the trem resess and that shouldn't be a problem. 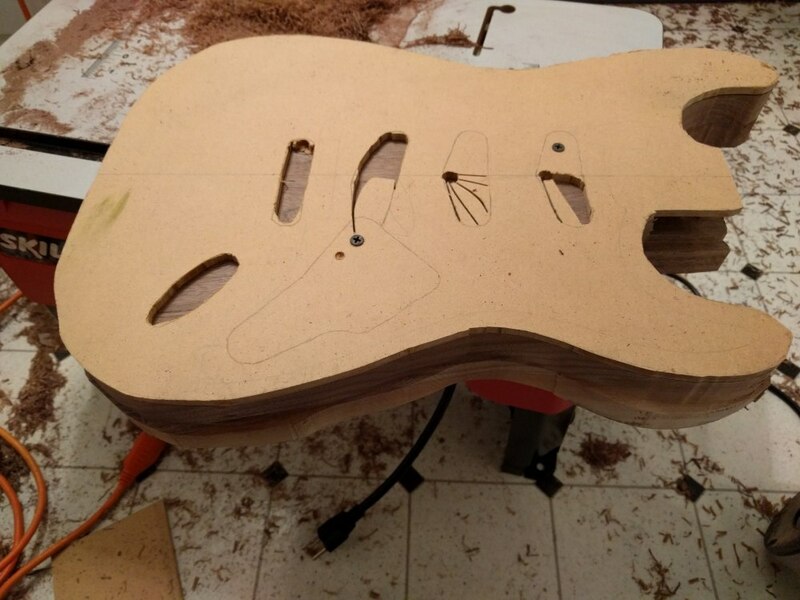 What I personally find dificult is to make sure the bridge and neck are aligned and at the right distance for intonating. I sugest you insert the neck, then put on the 1st & 6th strings on the trem and use them to make sure everything is aligned before dilling in the trem posts. 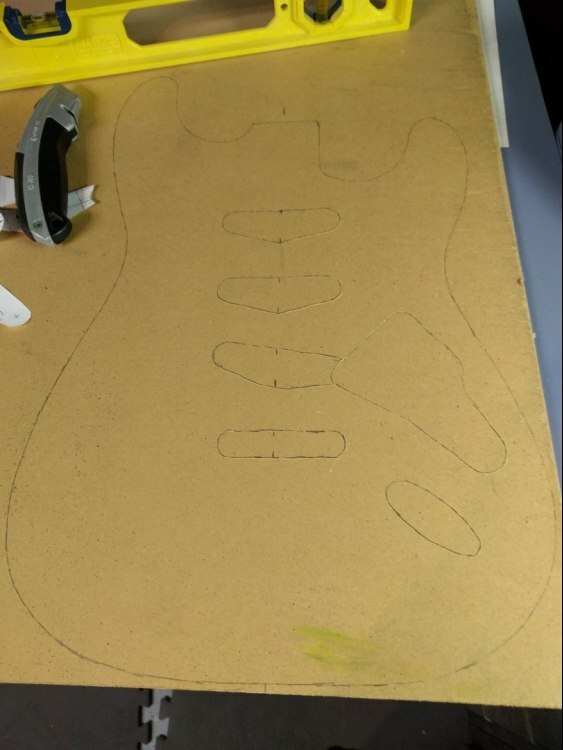 Then put in a pickup and make sure both strings are properlly intonated, it's always easier to do this before painting to avoid showing any mistakes.